BAFTA award winner and five-time BAFTA original music nominee James Hannigan is a composer & multi-instrumentalist profoundly focused on the emotional directness and personal nature of his music. Perhaps best known for his contributions to blockbuster franchises such as Harry Potter, Dead Space, Evil Genius, RuneScape, Theme Park, Warhammer and the Command & Conquer game series’, Hannigan’s music effortlessly straddles the indie and mainstream arenas, transcending the stylistic expectations and constraints of genre, delivering a compelling and recognisable voice all of its own. 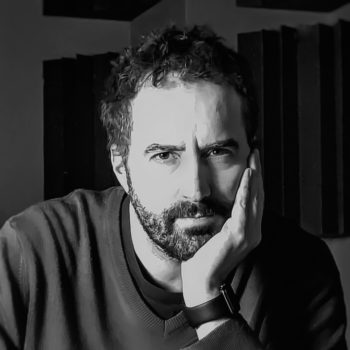 Hannigan’s work for TV and Radio includes BBC America’s Primeval, the award-winning BBC adaptations of Neil Gaiman’s Neverwhere and Good Omens, Amazon/Audible’s Alien trilogy and Terry Pratchett’s Unseen Academicals – and his unique and emotive music can be heard regularly all over the world in countless shows, commercials and trailers – ranging from Early Man to Top Gear. An IFMCA (International Film Music Critics Association) Award winner, Hannigan’s many credits include: RuneScape (the world’s most popular free MMORPG), Dead Space 3, Cloudy With a Chance of Meatballs, Pottermore, Command and Conquer: Red Alert 3 (the iconic theme of which, Soviet March, has collectively received over 50 million plays on YouTube), Nintendo’s Art Academy, Transformers Universe, Theme Park World (BAFTA Award, 2000), Terraria:Otherworld, Brute Force, Evil Genius (BAFTA Nomination, 2005), the groundbreaking interactive score of Republic: The Revolution (BAFTA Nomination, 2004), entries in the Warhammer andSpace Hulk series, Freelancer, Nintendo’s Super Smash Bros. 4 (additional music), Reign of Fire, Grand Prix, Cutthroat Island, Catwoman, The Lord of the Rings: Aragorn’s Quest, Harry Potter and the Order of the Phoenix (VG), Harry Potter and the Half-Blood Prince (VG; BAFTA nomination, 2010), Harry Potter and the Deathly Hallows Parts 1 & 2, the technically dazzling fusion of film and game: Privateer: The Darkening (with Clive Owen, John Hurt & Christopher Walken), Command and Conquer 4: Tiberian Twilight, Conquest: Frontier Wars, entries in the EA Sports F1 & FIFA series’ – and more. An interviewee and/or contributor for BBC Radio, Classic FM, BAFTA Conversations With Composers at the Royal Albert Hall, BEEP and many others, Hannigan has had his music performed globally by Video Games Live, The Eminence Symphony Orchestra, The Royal Philharmonic Orchestra, The Philharmonia and other ensembles, and he writes using words as well – once penning the first Audio-related cover feature for Develop Magazine. James is represented by COOL Music in London.